Designed to be biofuel compatible, this specially formulated polyurethane vapor recovery hose handles gasoline, ethanol (up to E98), diesel and biodiesel (up to B100 meeting ASTM D6751 criteria). The polyurethane construction is non-permeable, lighter weight than conventional TPR/rubber hose, and has superior sub-zero flexibility. The clear sidewall allows for easy inspection of material flow and the external helix provides for easy drag. Choose either Series 1970 with yellow helix, or Series 1975 with red helix. Designed to be biofuel compatible, this specially formulated polyurethane drop hose handles gasoline, ethanol (up to E98), diesel and biodiesel (up to B100 meeting ASTM D6751 criteria). The polyurethane construction is non-permeable, lighter weight than conventional TPR/rubber hose, and has superior sub-zero flexibility. The clear side wall allows for easy inspection of material flow and the external helix provides for easy drag. Embedded copper grounding wire safely dissipates static electricity. Also available in Series 1985 with green helix. A premium quality hose designed for the transfer of fuel oils or commercial gasoline in all applications ranging from home and commercial service, industrial and construction. The specially compounded construction is designed for low temperatures (-40°F) and the special carboxylated cover is non-marking and provides for superior abrasion resistance. Gasoline tank truck gravity drop hose. Designed to be lightweight, tough, durable and flexible. Specially designed to handle unleaded gasoline, diesel and up to 15% gasohol. It is rated up to 40% aromatic content. Series 2210 is designed and engineered specifically for constant contact use in the transfer of alternative fuels such as bio-diesel, bio-diesel blends, ethanol and ethanol blends. It can also be used for constant contact use in the transfer of commercial gasoline, diesel fuels, oils and other petroleum products. It is ideal for tank truck, terminal loading and in-plant operations. Meets MSHA 30 CFR 18.65 (Flame Resistant). Series 2215 is a suction and discharge hose designed for the transfer of petroleum products such as oils and refined fuels such as gasoline, diesel, ethanol, and bio-diesel (to B20 in dedicated service) and the cover is resistant to oils, ozone, and abrasion. Designed for heavy-duty service in the transfer of petroleum products up to 50% aromatic, including leaded and unleaded gasoline, oil, and diesel fuels. Heavy wall construction allows for the use of crimped or swaged couplings. An extremely flexible rubber hose used in the transfer of commercial gasoline, diesel fuels, oils, and other petroleum products including bio-diesel, bio-diesel blends, ethanol and ethanol blends. It is ideal for truck use where a super flexible maximum kink resistant fuel transfer hose is needed. Series 2235 is a corrugated flexible, lightweight suction and discharge hose designed to handle oil and refined fuels such as gasoline, diesel, ethanol and bio-diesel (to B20 in dedicated service). the cover is resistant to ozone, abrasion, oil, and weathering. Excellent for oilfield service truck use. “Arctic-Flex” is for use in ultra-low temperature operations for transferring gasoline, oil, and other petroleum products. Flexibility maintained down to -65°F (-54°C). Handles up to 30% aromatics. It is ideal for tank truck, fuel farm and oil field service truck use where a cold weather fuel transfer hose is needed. Series 2244 is a lightweight discharge hose designed to handle oil, refined fuels, gasohol blend and diesel fuel. Handles up to 50% aromatics. Series 2245 is designed for heavy-duty service in the transfer of petroleum products up to 50% aromatic, including leaded and unleaded gasoline, oil, and diesel fuels. Ideal for applications where an extremely lightweight, flexible hose with a high working pressure and small bend radius is required. Series 2248 is designed for heavy-duty service in the transfer of petroleum products up to 50% aromatic, including leaded and unleaded gasoline, oil, and diesel fuels. Ideal for applications where an extremely lightweight, flexible hose with a high working pressure and small bend radius is required. The specially formulated carboxylated Nitrile cover is designed for superior abrasion resistant applications. Series 2250 is designed for heavy-duty and extreme high-pressure service in the transfer of petroleum products up to 50% aromatic, including leaded and unleaded gasoline, oil and diesel fuels. The Neoprene cover is excellent for the resistance to weather, ozone, abrasion, oil, and sea water. 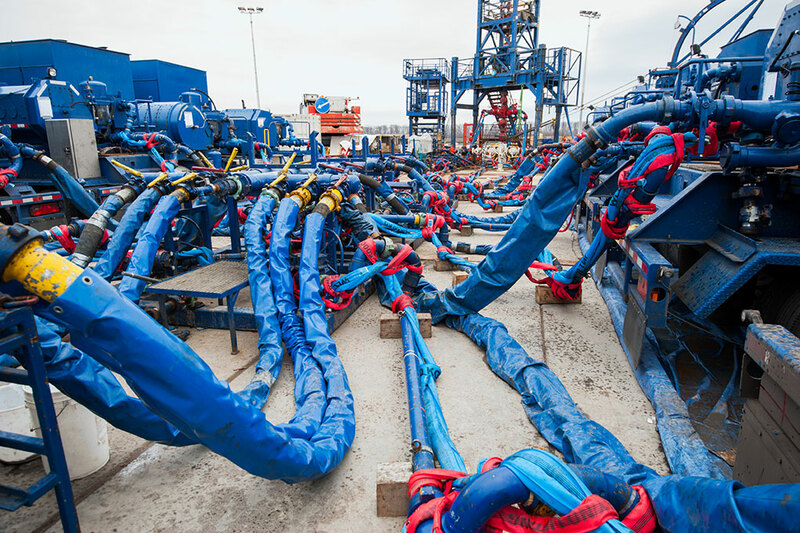 Heavy duty frac-tank hose designed to handle brine, crude oil, drilling mud, mild chemicals, petroleum waste, sediments, sludge, slurries, and water commonly found in oil field applications Specially designed for frac tank connections. Not recommended for refined petroleum products. A rugged versatile discharge hose designed to handle brine, mild chemicals, petroleum waste, sediments, sludge, sand slurries and water in oil field applications such as frac blender and tank service. Also available with our exclusive Tuff-Skin cover compound for severe abrasion resistant applications. Do not use for refined oil or fuel. Series 2280 is a flexible, lightweight suction and discharge hose designed to handle brine, crude oil, mild chemicals, petroleum waste, sediments, sludge, slurries, and water in harsh oil field bottom sediment and waste pit recovery applications. Do not use with refined oil or fuel. Series 2290 is designed for the transfer of high-temperature petroleum-based materials such as tar, asphalt, and hot oils. It is suitable for suction and discharge service on tank trucks, tank cars, or at bulk stations. Series 2295 is a heavy duty, high-pressure hose specifically designed for the transfer of hot oil at 275°F continuous / 300°F intermittent. The cover is highly resistant to abrasion, heat, oil, and weathering.